Those drawn to the warm, rustic feel of vintage-inspired interiors love how the Porter queen panel headboard suits their style. 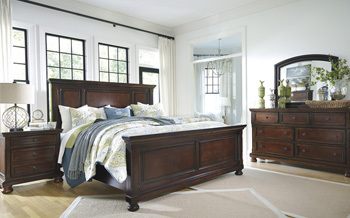 Rustic finish is rich with character, while high headboard makes an impressive stance. Beveled panel framing reflects beauty in the details. This King Sleigh Bed will embrace any master bedroom with it’s curved headboard, bold panels and turned bun feet. Keep additional blankets, clothing or other items nicely storage in the two storage drawer footboard. Sleep peacefully and wake refreshed in the classic beauty of this Sleigh Bed. Available in Queen, King and California King sizes. Of all the furniture stores in Sevierville, TN , Ogle Furniture has the best selection of the SIGNATURE ASHLEY- Item Series #: B697-BEDROOM SET. This item may also come in various sizes, styles, or colors. Please ask one of our representatives if we have the specific color/style you are looking for.